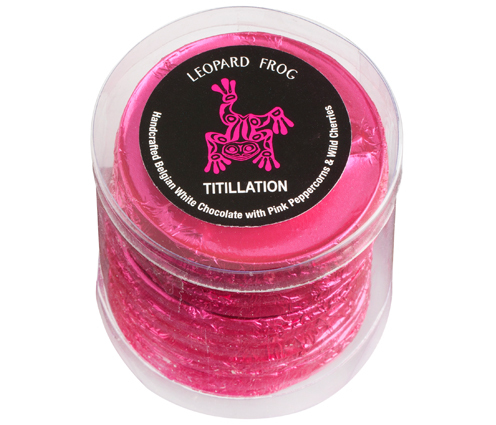 Titillation combines Bernard Callebaut Belgian white chocolate with freshly squeezed wild cherry essence and finely crushed pink peppercorns and other secret ingredients to deliver a vibrant chocolate experience. Mouth-watering white chocolate with freshly squeezed wild cherry essence and finely crushed organic pink peppercorns that deliver a vibrant chocolate experience satisfying to the mind, body and soul. ‘I am pretty sure that eating chocolate keeps wrinkles away because I have never seen a 10 year old with a Hersey bar and crows feet.’ – Amy Neftzger. Sugar, cocoa butter, whole milk, emulsifier (soya lecithin), pure wild cherry essence and finely crushed organic pink peppercorns. Cow’s milk, soya. This product may have come into contact with nuts during the craftmaking process.